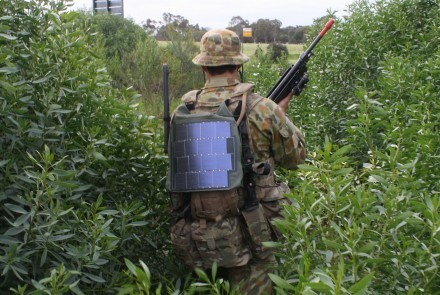 SLIVER solar panel-fitted backpacks might soon replace the heavy batteries soldiers carry! 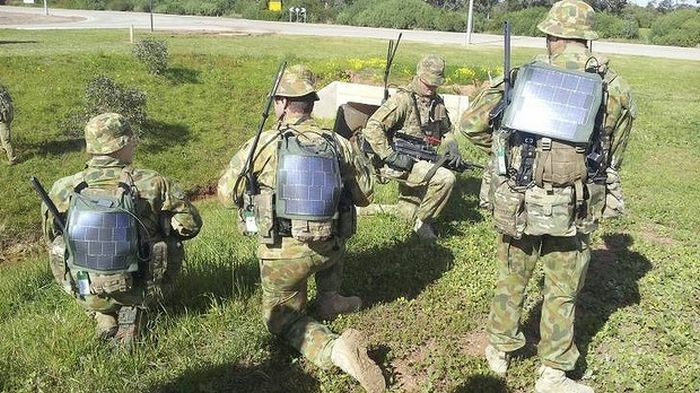 The new wearable SLIVER solar panels, designed to replace the heavy batteries that soldiers usually carry with lighter, rechargeable ones, has finally received a thumbs up for commercial release, after successful field tests conducted by the Australian National University(ANU). The technology is in the form of a military backpack fitted with specially-engineered, minute solar cells, which in turn help power the various electronic equipment soldiers use, including GPS tracking devices, night-vision goggles and so on. Much of the equipment carried by Australian soldiers requires heavy battery packs, such as night-vision goggles, lights, GPS devices and communication systems. Currently, soldiers depend on conventional batteries to power these devices. I’ve heard soldiers sometimes carry kilograms of batteries. If you can eliminate most of those batteries and replace them with rechargeable ones, you can save quite a lot… If you’re carrying fewer batteries you either have a lower weight or you have the same weight but more endurance…On a long mission, the solar panel does not wear out, it just keeps going and going, so you can have electric power days into a mission – or weeks or months. SLIVER cells have enabled the construction of efficient, rugged, flexible and light weight portable modules that convert light directly into electricity under a wide range of environmental conditions. The trials were performed by soldiers in a real mission environment with normal usage of power. In overcast conditions the ANU flexible panels produced sufficient power to maintain battery charge. In sunny conditions the panels charged the batteries… Based on the success of this demonstration, ANU will be commercializing the project outcomes with industrial partners. Although it will take another two or three years for the technology to be commercially available, the developers believe that its applications will not just be restricted to the military market. Being lightweight and pliable, these solar backpacks can be used by civilians as well, especially those working in the sun for long hours.